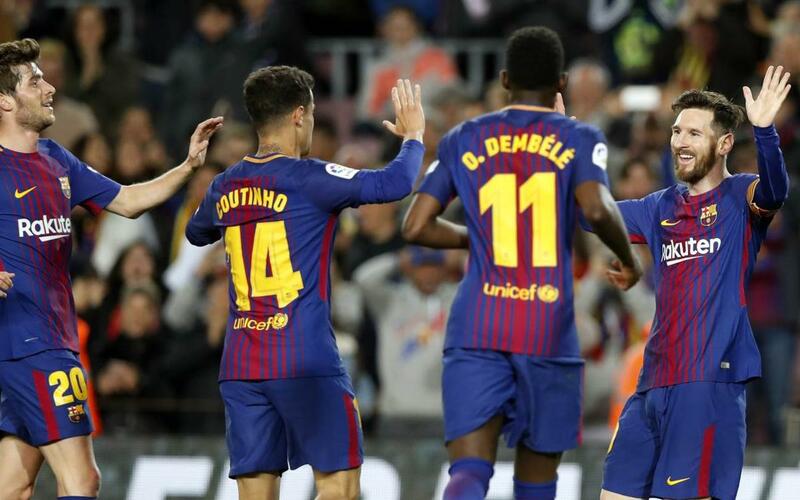 Barça are now just seven games away from going a complete Liga season without losing a game, while Saturday’s 3-1 defeat of Leganés also moves them 12 points clear of Atlético Madrid, who face a derby visit to the Bernabéu tomorrow. And their 38-match unbeaten run stretching back into last season has equalled Real Sociedad’s run from 1979 to 1980. Avoid defeat against Valencia next week, and a brand new all-time record will have been set. Those records aside, Leo Messi was once again at the forefront of the proceedings at the Camp Nou with his 29th Liga hat-trick and his third this season. Barça were all over the 'cucumber-growers' from the start. It was only a matter of time before the monologue of possession in the opposition’s half led to a goal, and Luis Suárez looked to have done just that when visiting keeper Ivan Cuellar miraculously intercepted what had looked like a simple tap-in. No panic. In a game as lop-sided as this, there would be plenty of chances to make up for that missed opportunity. Messi went into the game having scored one more goal this season that all of Leganés put together. And on 27 minutes that lead was extended to two as he converted his sixth direct free kick of the season. The goal meant that not only has the Argentinian now scored in six consecutive league games, but he has also scored from outside the box in each of those matches. Records don’t go back far enough to tell whether that has ever been done by anyone before! The Catalans continued to look comfortable after the break. Perhaps too comfortable, for Leganés hadn’t quite thrown in the towel. Darko Brasanac robbed Gerard Piqué, found former Liverpool forward Nabil el Zhar and the Moroccan fired home from the edge of the area. Perhaps this game was not as done and dusted as might have seemed? Leganés, who had never taken a point off Barça before, began to act as if they might be able to get something out of this game. Barça had other ideas. Messi had other ideas. Ivan Rakitic and Ousmane Dembélé were involved in the build-up to the Argentinian controlling the ball with his chest and slotting home. And that laid to rest any threat of Leganés springing an unexpected twist in the tale. It also took his tally for the season to 29, tying him at the top of the European Golden Shoe table with Mohamed Salah of Liverpool.